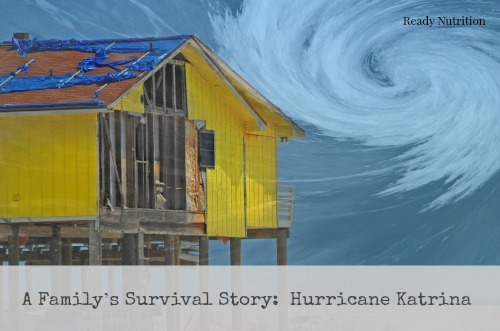 Now that Hurricane Season is approaching for the Spring, I thought you might like to read the story of how my family and I survived Hurricane Katrina back in 2005, as we were smack dab in the middle of it. Almost 10 years have passed, now, and although we weren’t unprepared, we learned a lot of lessons. Katrina tested us as a team and gave us the cohesive drive to prepare for any disaster in the years following it. This is our story. My wife, my mother-in-law, our three cats and I lived in Metairie, an unincorporated town with (at the time of Katrina) a population just under that of New Orleans. Metairie was “butted” up against New Orleans on the west side of the city, with the causeway running straight up into Lake Pontchartrain on Metairie’s eastern edge. We had a little 2nd and 3rd floor condominium approximately 3 miles from my wife’s work, one of the larger hospitals in the area. I had a private consulting firm and also moonlighted writing articles for a local New Orleans newspaper. August 27, 2005, just before the Hurricane, we realized what was about to occur and immediately took definitive action together as a family. After my wife reported to the hospital, called in for emergency preparation, I removed all of the food from the freezer to thaw. Then began the furious cooking of all the food in the refrigerator to prepare supplies. In the afternoon I began to work on the food that had been thawed out and helped out the rest to thaw: beef, chicken, everything. I cooked for about six more hours and packed everything up, placing it all in a large cooler with the other perishables from the refrigerator. Ziploc bags were the mainstay. I had it all going on: every burner, the stove, the George Foreman grill, the microwave, and a barbecue grill outside. I cooked about 14 hours that day and then collapsed for an hour before going to pick my wife up from work. The hospital had informed us that only one car could be kept in the garage per employee; they said nothing about additional people in the family seeking refuge for their vehicles in the garage. We left my wife’s car in the garage and I drove her home in my van. My mother-in-law and I would be permitted to stay in the hospital because she had been a recent patient (COPD) and her respirator would require electricity. They gave her a bed, and I would stay as her care provider, as the hospital would not take the time to do this. As far as food was concerned, my mother-in-law and I were on our own. My wife worked in the cardiac care unit of the hospital. They would be working her for 12-hour shifts and providing three hots and a cot for her, and paying her double time and a half. I had a consulting firm and also moonlighted writing articles for a local New Orleans newspaper. I shut down all of my planned activities, postponing all appointments for two weeks. It would actually be more than a month before I would be able work normally again. The day earlier, I had boarded up the condominium. We kept all of our boarding up supplies in a storage unit not even ¼ mile from home. With prior hurricanes, I had pre-cut 2”x2” pressure treated lumber and affixed it all around the border of the living room windows’ casings. They were pre-marked; all I had to do was set them in where I had marked the casings. Affixing them with galvanized deck screws through pre-drilled holes, I then attached (2) 4’ x 8’ sheets of 5/8” pressure treated plywood. The sheets’ bottom edges rested upon the concrete walkway of the balcony, and all of the other edges were seated flush upon the casings I had created, with their middle edges meeting upon a vertical strip of 2”x4” that I had emplaced. The plywood I secured with 3/8”dia x 4” galvanized deck-bolt screws with hexagonal heads. The heads would permit removal (unlike vandal proof screws) and reuse, but the hexagonal heads would help to prevent thieves from breaking in, since a ratchet would be required to extricate the bolts. The casements I made to provide a “gap” between the plywood and the windows for extra space, both for hurricane overpressures and/or flying debris that might have caused the plywood to lean inward and break the windows. This space would help to keep the glass intact in the event of such bowing. The other windows on that floor did not need such security. I used thinner plywood, and less lumber. Thieves were not a consideration: the window was in my office, and from its bottom edge it was approximately a twelve-foot drop to the ground. I also secured the French doors in my mother-in-law’s room and the window in my bedroom in a similar manner, sturdily bracing all of the plywood with 2” x 4” pieces. I had $1,100 in cash set aside, in bills no larger than 20’s. In addition, I filled up both of the vehicles with gasoline earlier in the day. I made it to the gas station just in time to take my place in a line that grew steadily by the minute. The gas stations were price gouging, inflating the prices of gasoline high above normal, but I did not concern myself with haggling for prices. I filled up one vehicle and then returned with the other one about fifteen minutes later. I arose early in the morning and began to cook all of the food from the freezer that had been thawed out: beef, chicken, everything. I cooked for about six hours and packed everything up, placing it all in a large cooler with the other perishables from the refrigerator. I then loaded about three weeks worth of canned supplies into several large blue bins. There were enough canned supplies for the three of us. We hurriedly packed some clothes and essentials, loading the van up to capacity. When the van was safely in the garage, later I would surreptitiously cross-load a large portion of it to the car to prevent visibility. We didn’t risk taking the cats to the garage. The hospital had provided the second floor of the garage as a designated area for the pets of the employees. The problem lay in the fact that the garage was one of openwork structure, and flying debris from the storm could enter and strike the vehicles. As our home was on the 2nd and 3rd floors and I had boarded up, the cats would be safer at home minus the noise of other animals along with the storm’s dangers. We set out copious amounts of food and water for them, and then the three of us left for the hospital in the van with the vehicle packed to the maximum. When the hurricane hit, for almost 18 hours it was a nightmare. Water was busting through the seals on all the windows and the whole building rocked. Down below in the cardiac care unit, water came in through the skylight where my wife was working. I spent a lot of time on my knees that night. The winds were thundering against the sides of the building. I’ll never forget that night. All of the hospitals of the greater metropolitan area of New Orleans were either destroyed or unusable with the exception of three. Ours was the only one that was fully functional and with a complete backup generator system. All telephones were out of commission. Food was brought to room occupants only once a day, and that only if the occupant was a patient in the room prior to the emergency. We had a month’s supply. Gangs of looters, drug dealers, and criminals were running rampant. From the garage of the hospital overlooking the west side, I saw street after street flooded to the depth of a man’s chest. This water remained all the way up until about 5-6 days after the hurricane had struck. There was no power, no electricity anywhere. The houses were flooded and debris, fallen trees, power line poles, wrecked cars, and other vehicles ruined many of them. Only those with boats were able to travel to and from the hospital. The National Guard (Army) patrolled the hospital grounds and guarded all of the access points to the hospital and the garages. Curfew was 2100 hrs and the governor of Louisiana had declared martial law. I would take a walk up on the top floor of the parking garage, sometimes with my wife, although she had to rest most of the time because of the shifts. From my view, I could see the suburb of Metairie. Our home was approximately 3 miles (5 kilometers) from the hospital, but the treetops and the distance broke line of sight. At night, only the hospital grounds had lights. The silence of the night was broken intermittently all night by the punctuation of small arms fire going off randomly all around the area. Criminals and looters were preying on residents who had remained and survived. They were also preying upon one another. The police and the army had incidents throughout the nighttime hours. From the East-side garage, the causeway bridge could be seen in ruin. Also, the causeway overpass where it linked with interstate highway 10 running to Baton Rouge was used as a “collection point” for people evacuated from the city. The refugees were then bussed to Baton Rouge; however, this occurred sporadically at best. About four thousand people were under the causeway overpass in the blazing sun during the day and the tepid, humid, summer night after dark. There was little water and virtually no food. Deaths occurred there, and the survivors were packed so closely together they were forced to sit and lie within their own excrement. At night one could see fires all over town. UH-60 Blackhawk helicopters were patrolling, and they passed overhead frequently. My wife and I were certain that our home had been destroyed and the cats were dead. We agonized over it. It was only with my wife’s pleadings that I stayed in the hospital. All I could think of was looters breaking into our home and killing the animals just out of cruelty, or for food, because this was happening all across the city. The LA National Guard, augmented by some boys from the 82nd Airborne Division were patrolling the grounds and the bottom floor of the hospital, which was slightly elevated above the floodwaters. Fistfights were breaking out between refugees inside several times a day, mostly over food, because the amounts were steadily decreasing. There were a couple of knife incidents and another fracas where a guy pulled a gun. The Army and the Guard brought in MRE’s and set up some mermites and T-rat stations, but it wasn’t enough and the situation was deteriorating rapidly. There was talk that they would be confiscating all food in the hospital for “redistribution.” Soon we would have to leave.